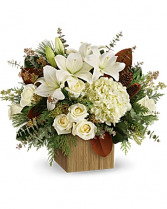 Give the gift of modern winter-white style with this breathtaking bouquet, hand-arranged in a chic cube. 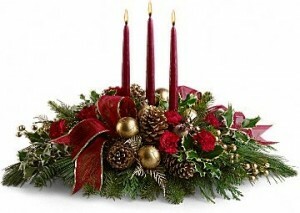 A fresh centerpiece of holly, noble fir, white pine, flat cedar and various flowers, Christmas ornaments, pinecones with one to three taper candles. 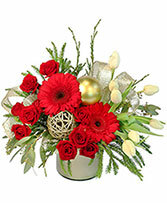 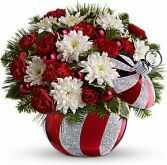 The cheerful bouquet includes red miniature carnations, white cushion spray chrysanthemums, noble fir, white pine and variegated holly. Delivered in a stylish ceramic ornament jar. 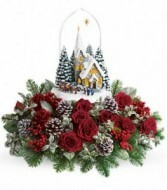 If sold out, a similar ornament container will be substituted. 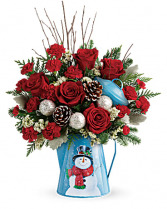 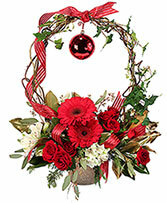 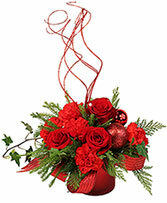 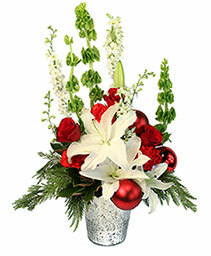 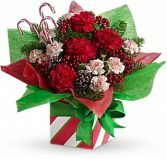 Approximately 11" W x 10" H.
The sprightly bouquet includes red carnations miniature peppermint carnations, noble fir and holly accented with candy canes. 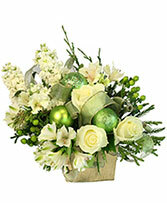 Delivered in a cheerful striped gift box packed with red and green tissue paper and set off with a green bow. 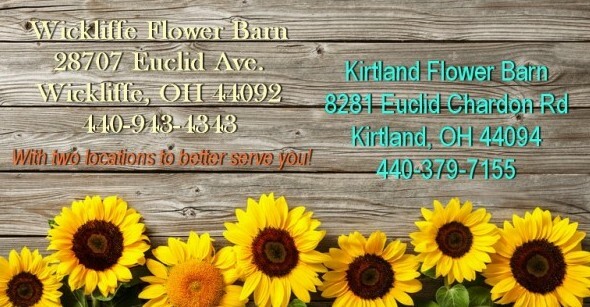 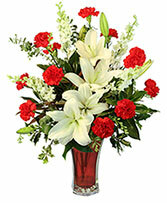 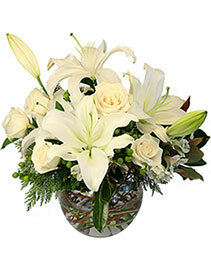 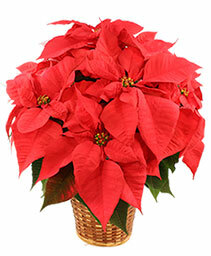 Approximately 15" W x 13 1/2" H. Flowers may be substitued based on availability for same look and feel. 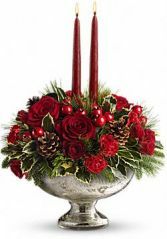 livered in a playful metal kettle with merry snowman motif, this lush mix of red roses and winter greens delivers classic Christmas style! 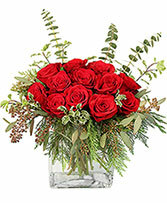 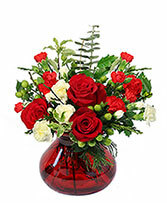 This bouquet includes red roses, red miniature carnations, white statice, birch, noble fir and flat cedar.